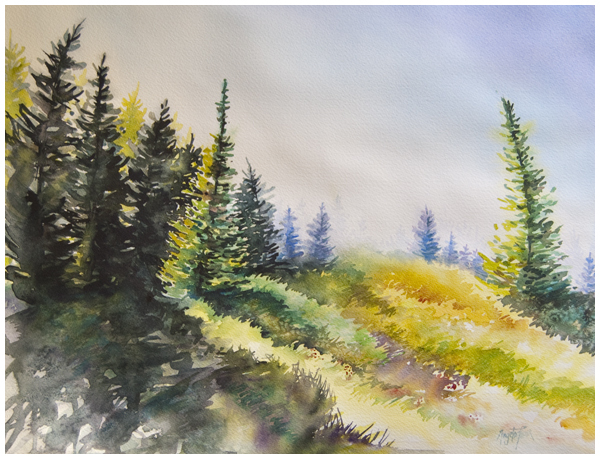 What really stands out in the mountains (and any time I'm surrounded by trees) is the play of light and shadow in the foliage, and I was drawn to paint it. Do you know that every painting is a challenge for me? It's a little scary to attempt to capture the essence of a scene in watercolour, and I'm never sure I'm going to be able to get it. It is exciting to try, and I've learned so much more since I've given myself permission to paint the same thing over and over again until I get it right. This is my completed "Huckleberry Hill" painting. After painting the small 7" x 10" study (below), I pulled out a larger sheet of paper (13" x 17") and took a stab at it again, adding more detail and depth in this larger painting. I especially love the way the light glows in this one, and the little atmospheric baby pines in the background. Our huckleberry trip will yield more paintings - I've been bitten by the landscape bug, and I'm finally feeling like I can paint a landscape in my own style, after struggling with landscape paintings all summer!